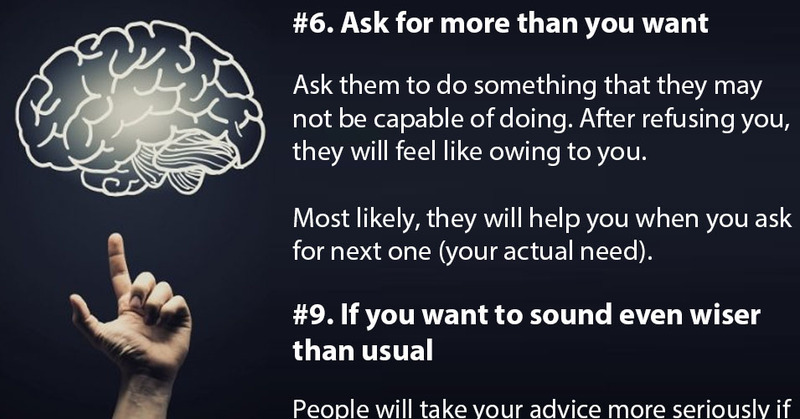 20 impressive psychological tricks that can influence anyone | Do You Know? Feel like getting even more of what you want? Want to be more likable, more personable, and just generally sort of...better? We all know that serious self-improvement takes time, but what about a little instant gratification? Here are a few simple tricks for getting what you want. We don't have to tell you that with great power comes great responsibility, but these are some tips for making your life a little easier at work, at home, and everywhere else. The next time you're trying to impress a hiring manager or the object of your affection, try subtly mimicking the way they're sitting and speaking - they'll probably like you more. Scientists call it the " chameleon effect ": We tend to like conversation partners that mimic our postures, mannerisms, and facial expressions. Just keep talking while handing people things if you need a little extra muscle. Many people will automatically take it without thinking (though some people won't, so be prepared for that, too --- especially if you're doling out valuables). 6. Try asking for more than you actually need to get. In order to make someone to have an authentic and willful desire to help you, ask them once to do something for you that they may not be capable of doing. Having been refused, you have created for yourself a person who will feel owing to you. Most likely, they will feel like helping you other times because they will have a guilty feeling of not being able to help in the first place. Make sure your hand is warm when you go in for the handshake. It's way nicer than a cold handshake and will make you seem more likable from the start. It's also a good idea to subtly mimic their gestures and posture. It's been shown to build trust. An easy way to tell if someone is watching you is to make yourself yawn, then see if anyone around you is also yawning. Yawning is contagious, so they'll likely yawn, as well, if they've been watching you. People will take your advice more seriously if you make it sound like it comes from someone older, specifically your father or some other paternal figure. For example, If you want your kids to eat broccoli, Go ahead and ask them if they want two or five stalks of broccoli instead of asking them if they want broccoli. Thus, you’ve made your mind and chose broccoli for their lunch, but they feel like they have really made their own decision. You can use the same old trick in different situations. Step into that upcoming staff meeting and sit yourself down right next to the person you think might lay into you. It's awkward to be aggressive towards someone sitting so close (for most people, anyway), so chances are, they'll be less confrontational. Nod your own head while asking a question if you want the other person to go along with what you're saying. The other person will be more inclined to agree when they see that gesture, and may begin nodding, as well. If you're going to use these tricks, remember to do so responsibly -- and for the love of adorable baby kittens, don't be too obvious about it! Whenever the person you're talking to says the word or words you're looking for, smile or give some kind of nonverbal positive affirmation. They'll start saying that word much more frequently. In his TED Talk , behavioral economist Dan Ariely explains the " decoy effect " using an old Economist advertisement as an example. While negotiating, research suggests you should emphasize to your partner what they're about to gain as opposed to what they're losing . For example, if you're trying to sell a car, you should say, "I'll give you my car for $1,000," instead of, "I want $1,000 for the car." A recent review of studies highlighted the effectiveness of the " but you are free " technique: Reaffirming someone's freedom to choose can double the chances that they'll do what you want, whether that's donating to a specific cause or taking a survey.